A House subcommittee hearing held Friday on Capitol Hill to discus Internet gaming and Rep. Joe Barton’s (R-TX) online poker bill centered on the issue of problem gambling and the desire for blanket Federal legislation. Wolf also said that Internet gaming would “affect the most vulnerable” consumers. “Congress will rue the day when [online gaming legislation] passes,” he said. Committee member Barton challenged his colleague by stating that poker is a game of skill and that his proposal is poker-only. Rep. Barney Frank (D-MA) was seated next to Wolf and said that the government is not in the business of telling people that they can’t gamble for entertainment. Frank said he is “shocked” by restricting the use of the Internet. Testimony was also echoed to suggest problem gamblers could be spotted easier on the Internet than in traditional brick-and-mortar operations. Safe guards could include a “self-exclusion list” and “cooling-off” periods for players. On the second panel, Mark Lipparelli, chairman of the Nevada Gaming Control Board, said that the Silver State “wants to see some amount of harmonization among the states” under Federal Internet gaming legislation. Lipparelli also gave a brief synopsis on Nevada’s progress in moving along with a plan to adopt regulations for an interactive gaming system that would run online poker. 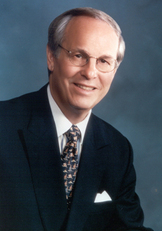 American Gaming Association President Frank Fahrenkopf also was a witness, saying that his lobbying group is “more in line with the Barton bill’s approach” than the Frank-Campbell measure. The AGA does not endorse any specific legislation. The AGA supports the idea of a state being able to opt in or out to offering online poker under a Federal measure, according to Fahrenkopf. Fahrenkopf and Dr. Rachel Volberg, a senior research scientist at the University of Chicago, had a lengthy conversation on the reliability of their respective studies on problem gambling. Fahrenkopf said that it is “settled science” that only one percent of gamblers become pathological — a trend that as historically remained stable despite the industry’s expansion over the decades. According to Volberg, the Internet makes individuals 10 times more likely to develop such disorders when they gamble. She said that if online gaming becomes legalized, $50 million should be set aside for the issue. Rounding out the second panel was Charles McIntyre of the New Hampshire Lottery Commission, who said that he is concerned about a potential loss of revenue from lotteries in the long term if web-based casino games were running. 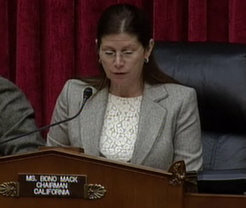 The hearing adjourned with Rep. Mary Bono Mack (R-CA) saying: “I look forward to our work together if [the Barton bill] moves forward.” No vote was held or scheduled. “No markup is imminent,” an aide to Bono Mack told National Journal. The House Energy and Commerce subcommittee on Commerce, Manufacturing, and Trade held its first hearing on Internet gaming in late October. In addition to Friday’s House hearing, on Thursday the United States Senate Committee on Indian Affairs held a hearing regarding implications for tribal casinos.